Interactive feature selection involves clicking a single feature in the view or digitizing a shape to select a set of features. Selecting features allows you to highlight and choose a subset of features on your map to use in subsequent exploration or analysis of your data. For example, applying a selection allows you to specify the features for which you want to calculate statistics, view attributes, edit, or define the set of features that comprise a layer. 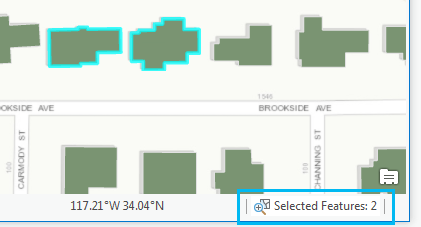 As you interactively select features by clicking or digitizing a shape on the map, the number of features selected is displayed at the bottom of the view. Zoom to the extent of the selected features by clicking the selected features count. Once you review and set your selection options, you can select features interactively using any of the following selection tools listed in the Selection group on the Map tab. Selection tools for editing scenarios are also listed on the Edit tab. Click the map, and draw the prescribed shape across the feature or features. For points and line layers, you can select a feature by clicking anywhere on its symbology. In a scene view (3D), features blocked by terrain or other features will not be selected. In the Selection group, on the Map tab, click the selection drop-down arrow and choose a tool. Draw the respective shape across the feature or features using the chosen selection tool. Rectangle —Click a point feature or segment, or click and drag the rectangle across the feature. Polygon —Click the map to create the vertices of the polygon. Double-click to close the polygon and select the feature. Lasso —Press and hold the left mouse button and draw with the pointer to create the freehand shape. Circle —Press and hold the left mouse button and draw with the pointer to create the circle. Line —Click the map to create the vertices of the line. Double-click to end the line and make the selection. Trace —Click a line or polygon segment and draw the pointer along the boundary and other contiguous features connecting segments by tracing along them. Double-click to end the trace and make the selection (2D views only). Use cases include selecting a water main, roads, or parcel lines. Work with the selected features or clear the selection by clicking Clear in the Selection group on the Map tab. You can also deselect all selected features at once by clicking somewhere in the view where there are no features or clicking a feature of a layer that is not selectable. Automatically select related records: If you've customized your layer's selection properties to automatically select related records, any selection made for that layer will immediately propagate the selection to select the feature or table rows for all related records of the selected features. Shift—Press and hold to add features to an existing selection. You can click individual features or digitize around a collection. Ctrl—Press and hold to remove one or more features from the existing selection. Ctrl+Shift—Press and hold to select from the current selection and deselect all others. C—Press and hold to navigate the view. This is useful in 3D to select features that are blocked by the current view. The tool's pointer temporarily switches to navigation so you can use the left, middle, and right mouse buttons to navigate. Releasing the C key returns you to selection mode so you can complete your task without leaving the view to change tools.